In this demo I would like to show – how to connect to External Database such as MYSQL through Hibernate using JQUERY,AJAX and JSON. Before proceeding to this demo tutorial I would suggest to go through the below links where in I explained how to Call a Servlet using JQUERY,AJAX and JSON. I have already shown how to create a Dynamic Web Project in the above links. Copy all the jar files mentioned in pre-requisite to WebContent->WEB-INF->lib. Simple way is to drag and drop the files,select copy option and press ok.
* The persistent class for the countrydetails database table. 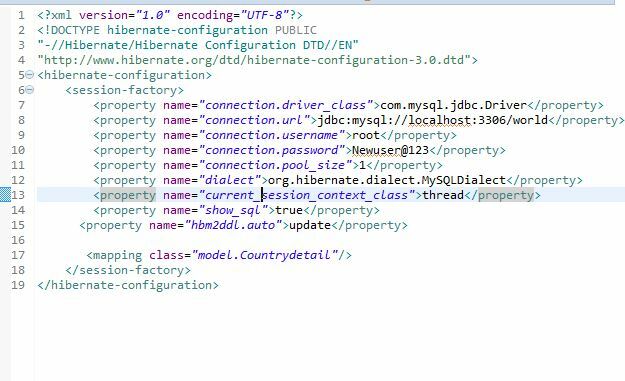 Create “hibernate.cfg.xml” in src folder. Enter the below code in “hibernate.cfg.cml”. Sorry for the late reply as I did not login to sdn for few months now because of other work commitments. Have you resolved your issues by now?